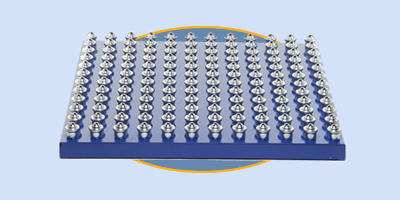 Ball Transfer Tables - Roll-A-Way Conveyors Inc. The ball transfer table is ideal for products which must be rotated or positioned from one work station to another. Steel balls are friction-free and easily glide boxes, packages, etc. in any direction. Can be floor mounted or placed on adjustable H-stands for work-height jobs. Three separate ball styles available. Custom sizes optional: stainless steel tables, stainless or nylon ball, etc.